Giving thanks is something most of us are thinking about during this time of year, right before Thanksgiving. What about each and every day? How do you do with giving thanks to those in your life and for things in your life, daily? Shown is the newest photo of my parents, taken just a couple weeks ago by my niece. 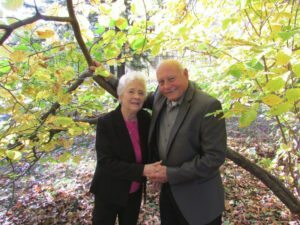 My parents, Homer and Mary, are still in love after almost 66 years of marriage, 5 children, 14 grandchildren and 22 great grandchildren ( if I counted right! ).I am flying there in a couple days to be with all of them for a week. I get to stay in the home and bedroom I grew up in! How amazing and special is that? So I’m giving thanks first and foremost to my parents for their love and support they have given me all of my life. They taught all of us love of God, family and being of service, through their example.We are all so blessed to have my parents here with us and have them in the good health they are in. I give thanks for them every morning and every night. I’m fortunate to have a close family. Even though I’m the only child out of 5 that doesn’t still live in the Toledo, Ohio area, I keep in contact often. I am giving thanks for Hale and the life we share together. I give thanks for our 3 children and 4 grandchildren between us.I am giving thanks for all of my family, whether blood related or the family I have created over the years. The many friends who are in my life, I cherish. Both the ones I’ve had since childhood and the newer friends from my adult life. So thankful for the family of souls who were with us at our Glow Kauai Retreat. We were all an example of how quickly people can come together for 7 days and 7 nights, blend and feel safe to share who we are with each other. All while having so much fun, learning about ourselves, life, and enjoying all of the sights of the gorgeous island of Kauai. I give thanks for our freedom living in the United States of America and for all of the people in our military now and our veterans, who have kept us free. I give thanks for my great health and body. What are you giving thanks for today and every day? I hope you will take the time to appreciate everyone and everything you have in your life. Even all of the people who have been in your life that have caused you pain, for without them, you wouldn’t be who you are today. I am giving thanks for the people who will find their way to grow and rejuvenate themselves. 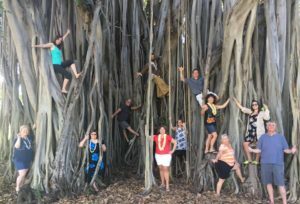 My next Glow Kauai Vacation Spiritual Retreat, October 27-November 3, 2017. New photos and videos will be up in the near future from 2016’s retreat. Contact me soon to see if this will be a fit for you! I’m giving thanks to you, the people who read my blog each week. I hope you take something away for your own life to become the best you can be! The retreat tree is so cool. They are one of things I love about Florida. Yes to the reminders we have so much to be grateful for every day.